Zombie Map of the World | We Zombie! The guys at floatingsheep.org have posted an excerpt from the edited collection Zombies in the Academy: Living Death in Higher Education, which has a map showing where the world’s zombie content is located. They attempted to discern how the spatial patterns exhibited by geo-coded content are reflective of some underlying social structure. 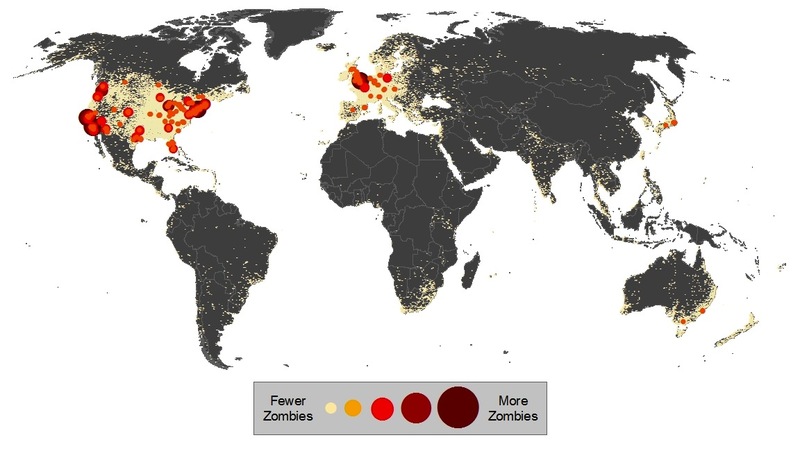 The obvious trend was the concentration of most zombie-related content in the largest Anglophone cities. The article provides a brief analysis of the data, culled by referencing the term “zombie” across the Google Maps database. One flaw in the data is that the searches for the keywords were conducted only in English and Latin characters, so references in other languages and scripts are absent.